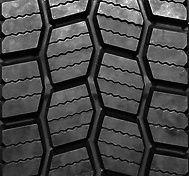 Advanced tread compounding for maximum fuel efficiency. Innovative groove geometry minimizes stone retention. Proven pattern delivers excellent wear and long removal mileage.